MR. COUGHLAN: May it please you, Sir. Last week at the commencement of these public sittings I made an opening statement dealing at length with material and information which had been made available to the Tribunal. I am now directed by you, Sir, to make a further outline statement at this stage. In the course of that opening statement, I referred to certain information furnished to the Tribunal by Mr. Bernard Dunne concerning what I described as the Tripleplan payment. I indicated that Mr. Dunne had informed the Tribunal that he had no recollection of giving any instructions in relation to the payment to Tripleplan. I also indicated that Mr. Dunne had informed the Tribunal that he did not authorise the giving of any instructions in relation to the payment or the payment itself. I indicated that it was not his intention that any such payment should be made and he never gave any instructions that Mr. Charles Haughey was to receive this amount either by this payment or in any other way. Mr. Dunne has now informed the Tribunal that while he would have expected to remember giving instructions to Mr. Price or in the alternative to Mr. Fox concerning the cheque, he is astonished that he has no such recollection. He has informed the Tribunal that it is now apparent that he authorised the payment. He has informed the Tribunal that he had no recollection of a company called Tripleplan, nor any recollection of agreeing, instructing or authorising this company to be given any of the monies in question. He has further informed the Tribunal that the only conclusion he can come to from the information made available by the Tribunal is that he must have authorised the payment to Mr. Haughey and that while he believed that the first payment he had authorised to be made to Mr. Haughey was as set out in the statement to the McCracken Tribunal, he now concludes that he must have authorised the payment to Mr. Haughey earlier than he had previously believed. The Tribunal has already indicated, though not exhaustively, the lines of inquiry likely to be pursued on the basis of the information and material made available to it. From this information made available by Mr. Dunne, it would seem that he authorised the payment in question. 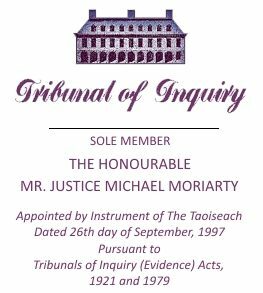 In addition to the lines of inquiry already indicated, the Tribunal will wish to pursue a line of inquiry as to when this was or must have been known to persons centrally involved with this cheque and how such a state of knowledge, if it existed, was subsequently dealt with by them. In furnishing previous information and in furnishing this information to the Tribunal Mr. Dunne has informed the Tribunal that he intends to further review the documentation available to him so as to ensure that the details which he has furnished are correct. CHAIRMAN: Mr. Connolly I had indicated at the outset of last week’s sittings, certain arrangements curtailing the scope, in general terms, of what is somewhat loosely and inaccurately described as cross-examination, but in the context of the significance of the present evidence in the course of the Tribunal generally, and having regard to the potential interests of certain parties who are represented, I would accept that this is one of the situations in which some reasonable latitude by way of questioning has to be afforded to a limited number of persons and it seems to me, subject to any observations, if parties do propose to exercise their entitlement to question the sequence that seems most proper to me is firstly Mr. Connolly if he wishes to raise any limited matters, then Mr. Hardiman, then Mr. Gallagher, Mr. Murray, then Mr. McGonigal and lastly, Mr. Collins. Does that proposed course of things commend itself to parties? Very good.